We started July in Charlotte with the Leach clan, complete with Fireworks and all kinds of family fun (see Family Trip to Charlotte). But the fun didn't stop there! 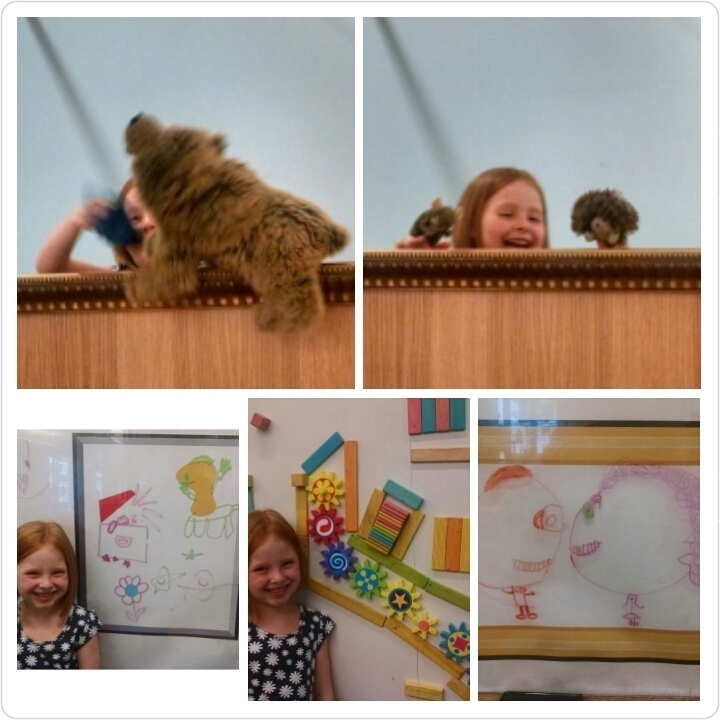 Aylin and I explored the children's area at Crystal Bridges, loving the fact that this is 1/2 a mile from our house. 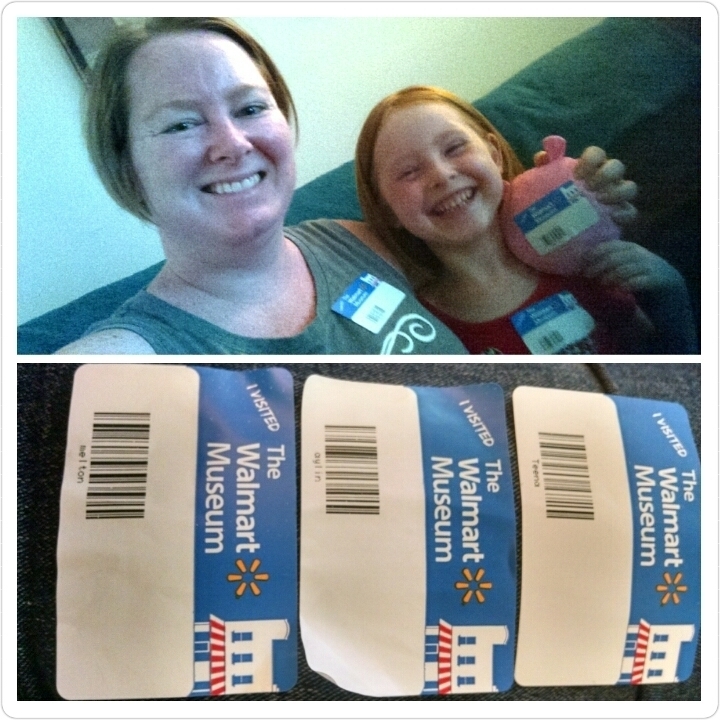 Mind you this was before the Amazeum opened which is a whole other ball of wax... Aylin put on puppet shows for me, sketched silhouettes, and created lots of fun things. 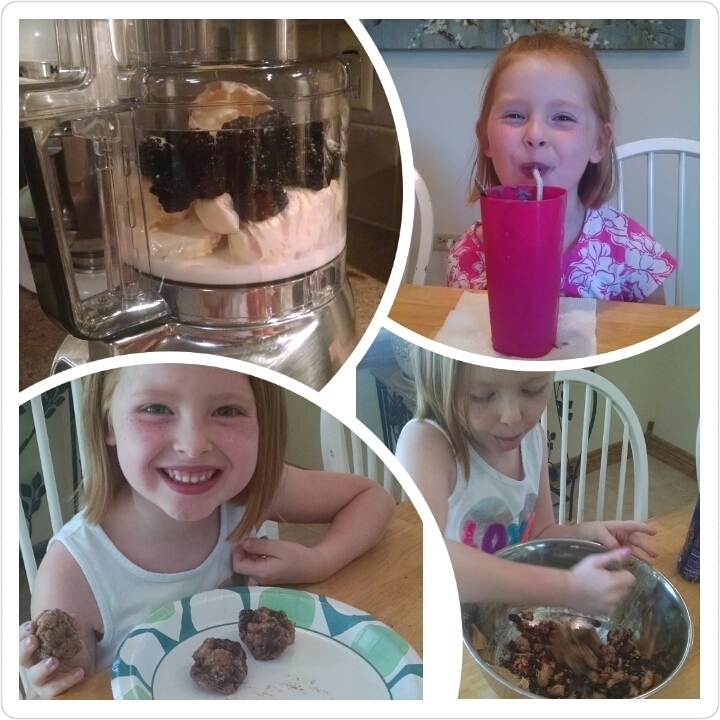 We made blackberry shakes, and Aylin created her very own concoction = pb&j balls! The recipe was something she was very intent on doing by herself. It started with a dash of salt, then she ripped up a few pieces of bread. Spoon fulls of peanut butter, jelly, and maybe ever a bit of honey... then it was all carefully mixed together and balled up. Next you put it in the freezer for a few minutes, and the Voila! PB&J Balls! She was so in love with her recipe that the next day while I was mowing the lawn she decided to make it again without supervision. There was at least one fully failed attempt that I later found in the trash during that time. 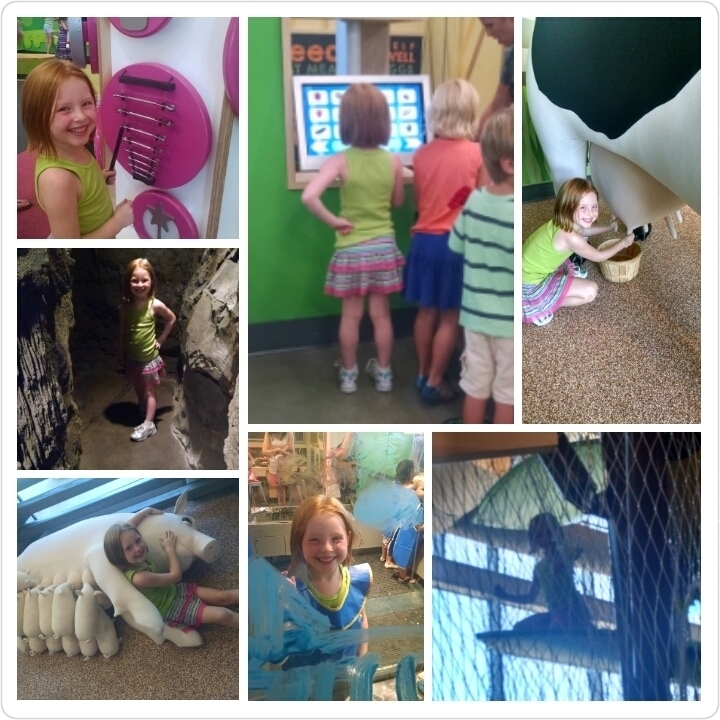 Next we finally got to play at the AMAZEUM! We will probably be spending every spare moment at this place, and likely will lose track of many hours at a time... Thank God they serve coffee in the cafe. Someone had momma's in mind when they chose those menu options! We played on the square some more. Aylin lost her 2nd tooth. 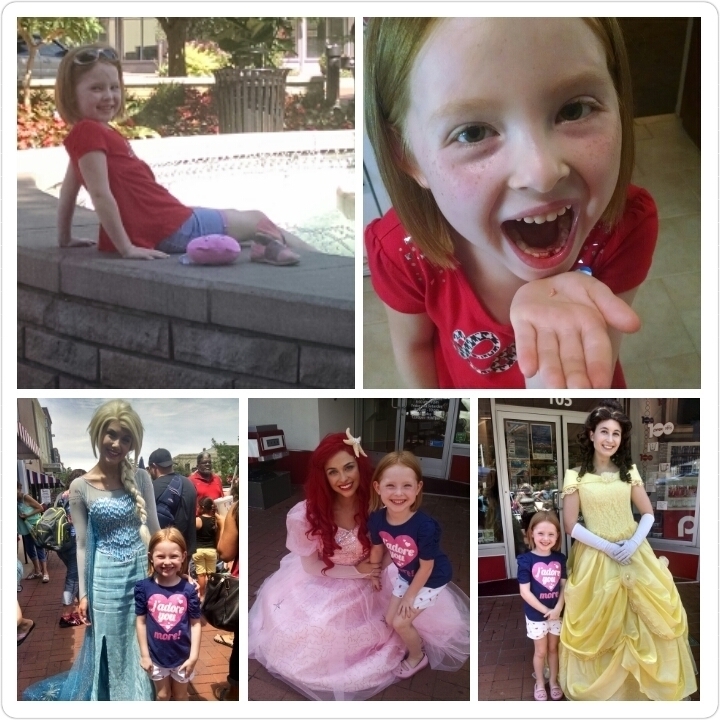 She also got to meet Elsa, Ariel, and Belle on the Bentonville square! 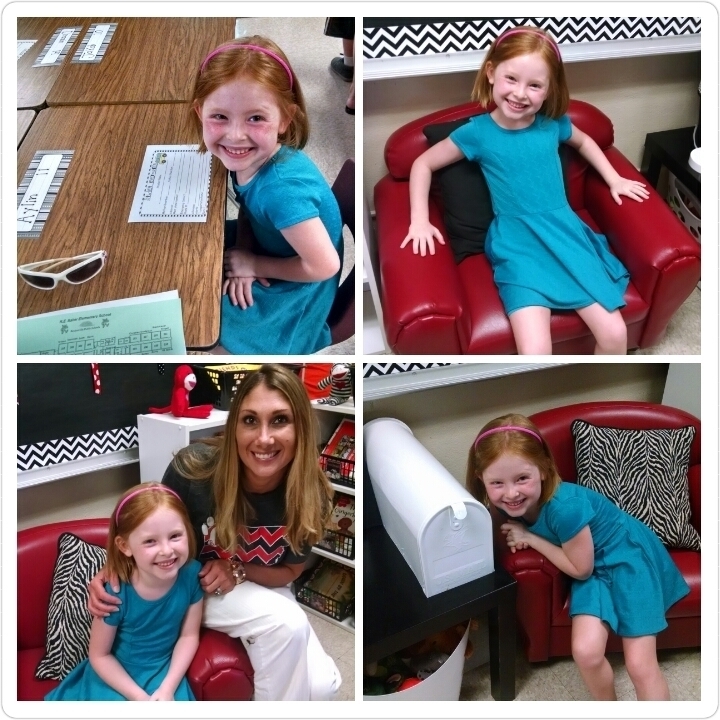 Aylin got to meet her First Grade teacher at meet the Teacher night, and explore her new classroom for the upcoming school year. 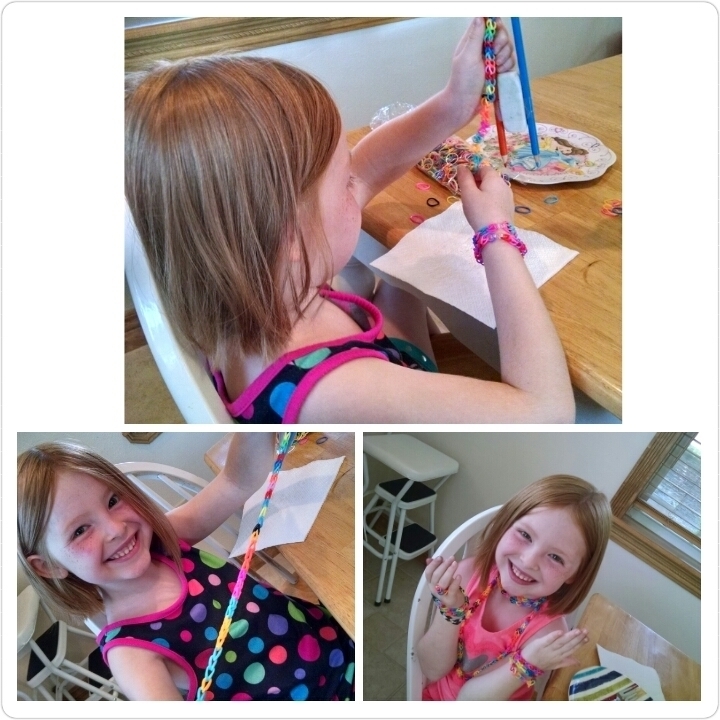 Aylin learned how to make loom band bracelets, and we found that it's actually easier to make them without the loom, than with. Either using your fingers, or use a set of pencils with an eraser placed between them and tape everything together. Now we have little colored rubber bands everywhere! 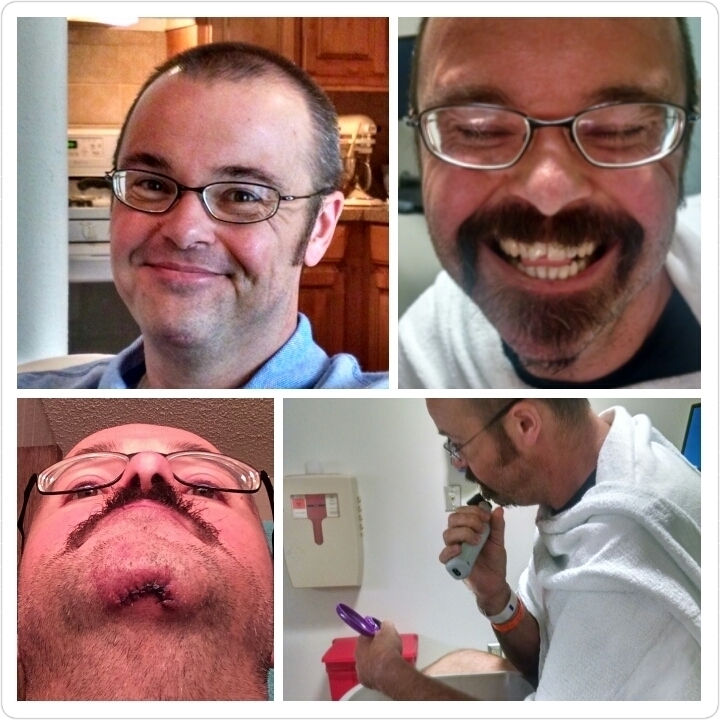 Last, but certainly not least; Jeff had his bicycle accident. I'm sure you'll hear him tell the story at some point, but he basically lost control of his bike while riding along the trail around lake Fayetteville on his lunch break. He says he got going too fast, and hit a wet area while going around a corner and low sided. He rolled, and his bike also rolled. Into him. Serveral times. He ended up with no broken bones, but got hit in the face with the handlebars breaking his top two middle teeth. One tooth is chipped, and the other tooth looks like a spiders web from under an x-ray and is completely dead. There will need to be at least one root canal and crown, it is undecided yet as to whether both teeth will need root canals/crowns. He also got 7 stitches under his chin. Both of his wrists and hands were sprained and swollen for quite some time. His neck, arms and back were also stiff and sore like he'd jammed the entire upper half of his body. He still, almost 3 weeks later, has some soreness and stiffness in his hands and face. His dentist told him he was very lucky he hadn't dislocated his jaw with the amount of impact he sustained. I'm just thankful the damage isn't worse, and that ultimately he walked away from it without any major damage that can't be repaired. He was wearing a helmet and gloves, and both of those were beat up/torn up in the process of the wreck. Both are a testament to how bad the damage could have been. Ironically the bike is fine. The plastic end plugs on the handlebars are broke or missing, and the foam around the handles were scuffed up. But otherwise the bike is just fine.